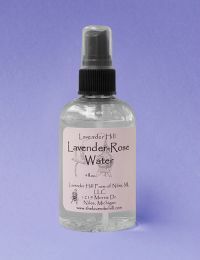 Lavender Hill Farm Distilled Lavender Water is produced by steam distilling our fresh, farm-grown lavender flowers. The remaining fragrant water or "hydrosol" that is collected after separating the essential oil, contains many water soluble fragrance components of the lavender flowers. The product if stored at room temperature should keep for at least a year or more, with subtle changes in scent over time. Our distilled water is wonderful as a linen spray, light room spray, a laundry rinse, as a body spray, facial toner, or for use in your own cosmetics or household products. 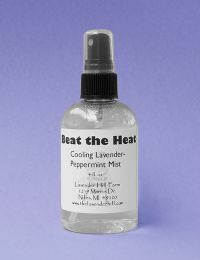 Lavender blends well with other floral and herbal waters for different effects. 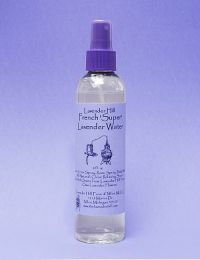 Lavender Hill 'Super' Lavender Water, 4 oz. 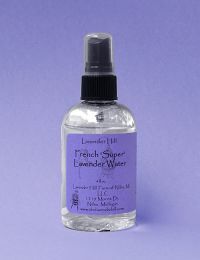 Lavender Hill 'Super' Lavender Water, 8 oz.